Armed police are patrolling the streets of Bristol amid worries drug dealers carrying firearms have moved into the area. An undisclosed number of officers have been patrolling Ashley and Lawrence Hill after police received worrying information. It is feared rival gangs of armed drug dealers have moved into the city. Chief Superintendent Mike Roe said: "Over the last few days we have seen an increase in tension between rival drug dealers. "Of particular concern is intelligence that these rival dealers may be prepared to use firearms against each other." Deputy Lord Lieutenant of Bristol David John said the city's residents wanted to get armed criminals off the streets. 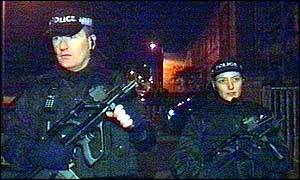 He said: "The mood has changed since the 80s, when there was a feeling the police were occupying areas like St Pauls. "Now local residents want to help the police and they want the drug dealers and people who are armed to be disarmed and locked up." A spokesperson for Avon and Somerset Police said the armed officers were a precautionary measure. "Uniformed officers, armed patrols and dog handlers have been patrolling Grosvenor and Stapleton Roads since 2000 GMT on Tuesday, and will continue until the disturbance is finished. "They are there to reassure the public. Community leaders have been informed."